Background: The Louisiana Waterthrush is a small migratory songbird listed as special concern in Ontario under the Endangered Species Act and special concern in Canada under the Species at Risk Act. In Canada, this species occurs predominantly in Ontario. Estimates suggest the abundance of Louisiana Waterthrush is fairly stable, but low, with about 105 to 195 breeding pairs occurring in Canada. This species is not well documented by monitoring programs such as the Breeding Bird Survey because it is rare and arrives early in the spring; the birds vocalize less frequently once they’ve started nesting, when most breeding bird surveys occur. Since 2012, the Canadian Wildlife Service has been conducting field surveys to assess the distribution and abundance of Louisiana Waterthrush in areas that have not previously been thoroughly surveyed. 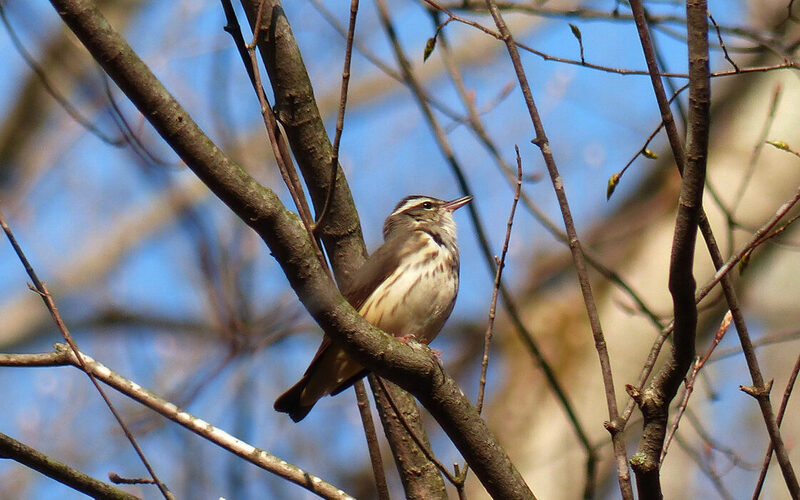 Project work: We surveyed for Louisiana Waterthrush along the Oak Ridges Moraine (north of the greater Toronto area) at locations where the species had been detected historically and at locations predicted to be suitable habitat. We conducted 82 surveys on 37 watercourses, varying from small tributaries to medium-sized rivers. We detected Louisiana Waterthrush at less than 5% of the locations surveyed. Conservation implications: We found that Louisiana Waterthrush were uncommon along the Oak Ridges Moraine and that, overall, habitat conditions did not appear suitable at most survey locations. This information is useful for understanding the distribution of the species in Ontario because a targeted survey for Louisiana Waterthrush along the Oak Ridges Moraine had not previously been conducted and the moraine was considered to be an area that could provide breeding habitat for Louisiana Waterthrush. Species status update: In 2015, the Committee on the Status of Endangered Wildlife in Canada (COSEWIC) released a new Assessment and Status Report for Louisiana Waterthrush. In 2016, the status of Louisiana Waterthrush under Ontario’s Endangered Species Act was changed from special concern to threatened. Funding: BECO was contracted by Environment Canada to conduct this research.